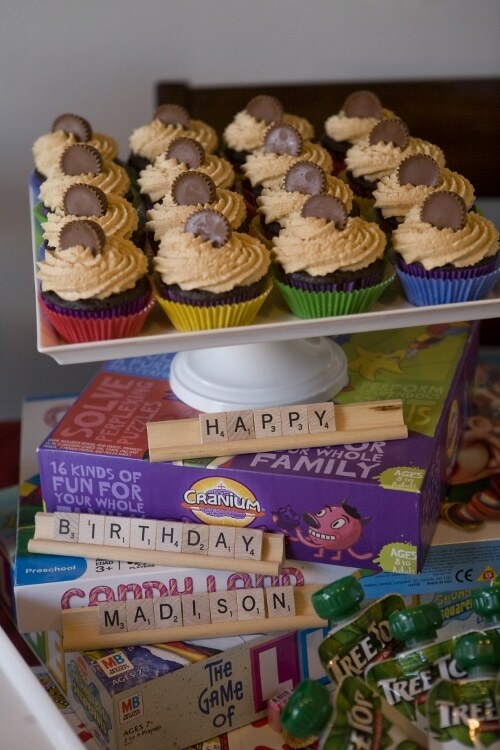 In case you missed it, check out her amazing Pirate party she threw for her youngest daughter. Now for game night! 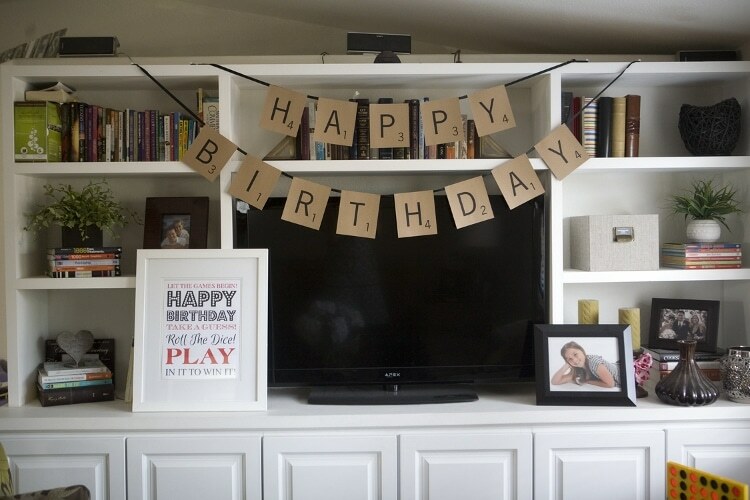 Let’s start off with the party décor. Courtney designed and printed out signs and framed them. 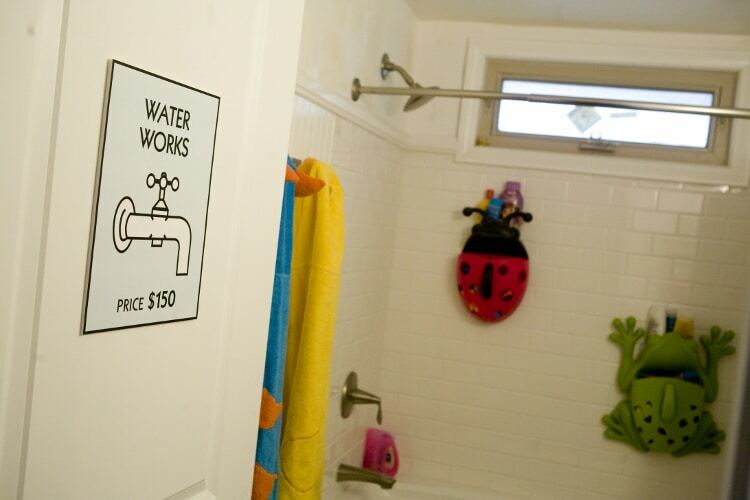 She also placed the Monopoly Sign “Waterworks” on the bathroom door and used two Twister mats as backdrops for the drink station. 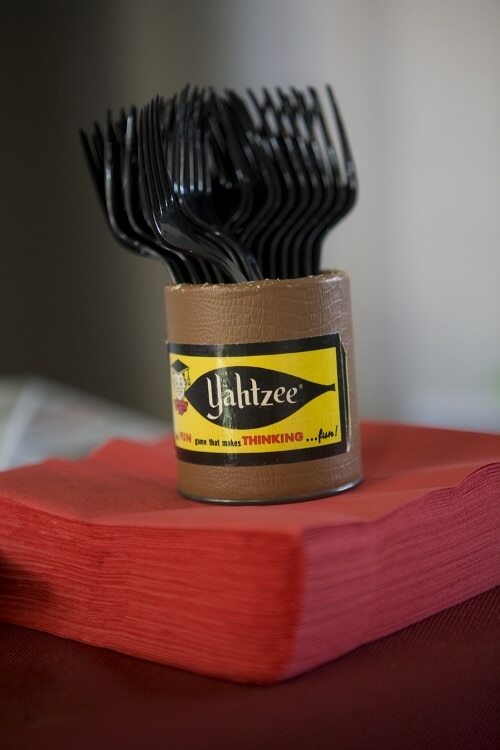 Another very simple idea is spelling out “Happy Birthday Madison” with Scrabble letters on the buffet table and used a Yahtzee dice cup as a utensil caddy. It can’t get much easier than that! 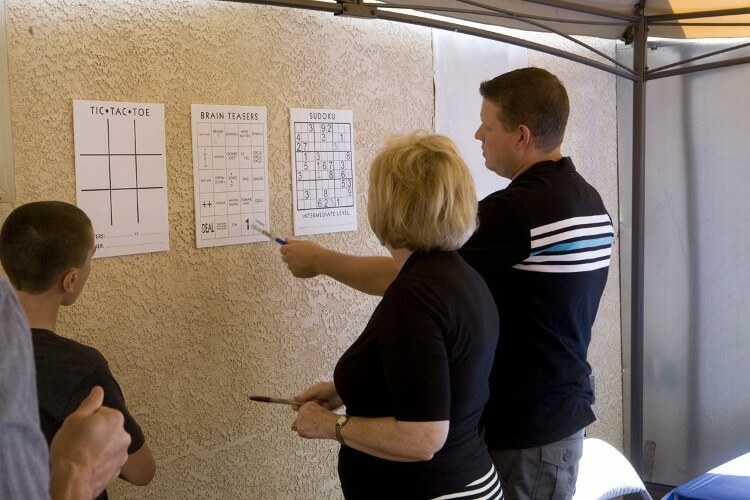 Outside Courtney posted brain teasers and other games for people to play with friends and family at their leisure. 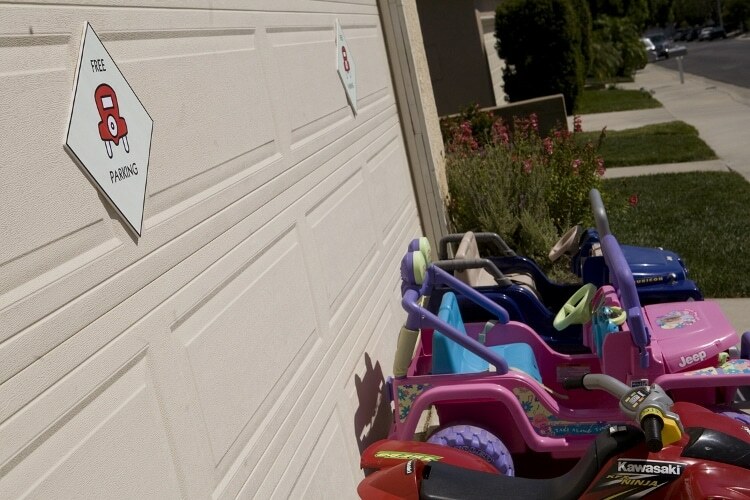 She posted the Monopoly Sign “Free Parking” on the garage where the kids parked their power wheels. 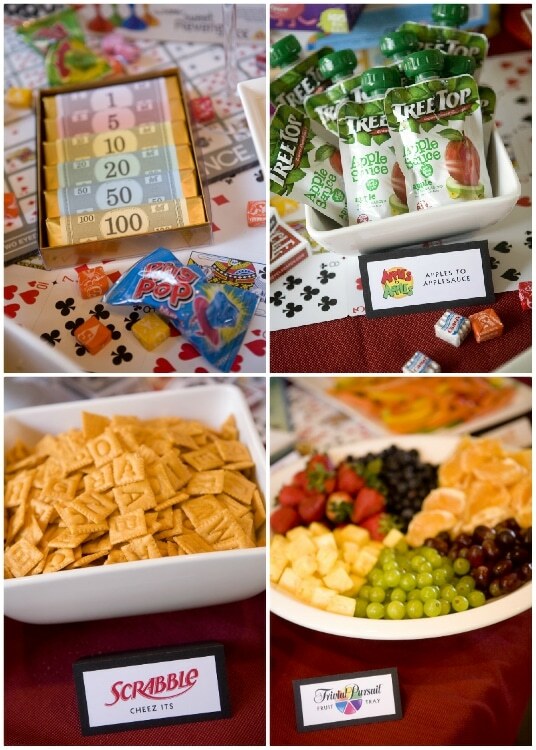 Courtney shared three simple DIY ideas that she made for the party including a table runner, party banner and prize medals. 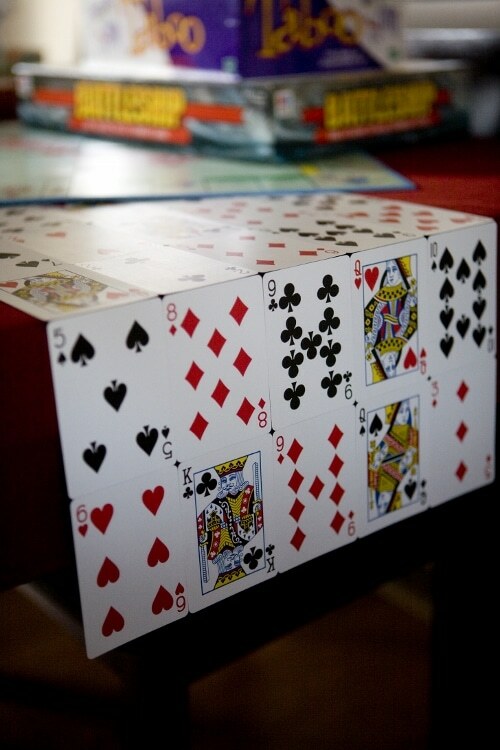 To make the playing card table runner, all you need is clear tape and a deck of cards. Courtney made rows of five making sure the cards were in random order. Use tape to attach the cards on the back. 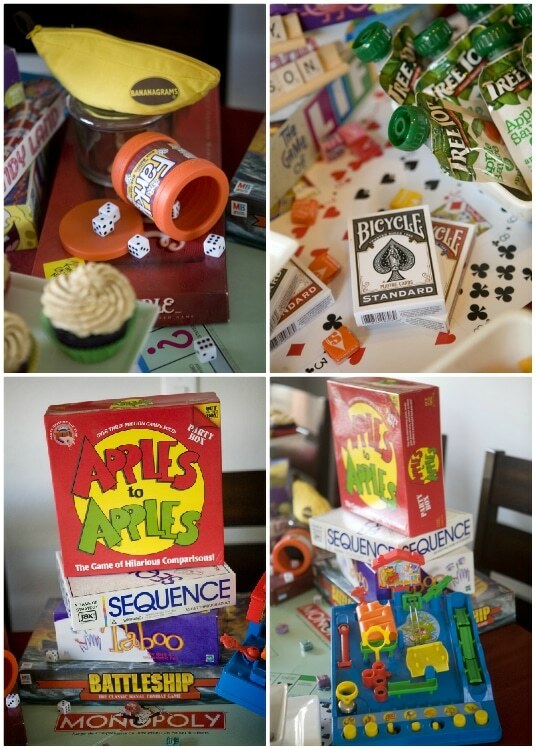 This way, you can easily remove the tape when the party is over and still use the playing cards. She also made her daughter’s banner with her name look like scrabble letters. Courtney actually printed it out on wood grain paper! So smart! They did play several Minute to Win It games as well as life size Spot-It. Courtney divided the family into two teams. 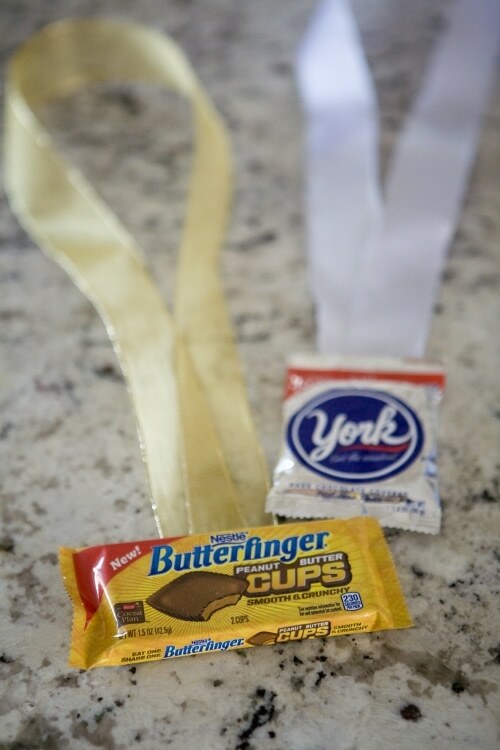 The first-place team got the Butterfinger “Gold Medals” and the losing team got the 2nd place York Patty “Silver Medals”. To make these, cut gold and silver ribbon to length and tape them on the back of the candy bars. 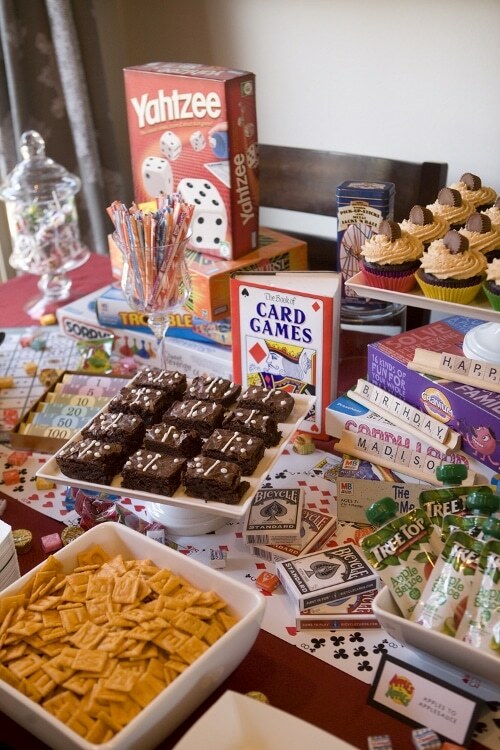 The food table served not only as yummy treats, but as part of the décor as well. She served, Scrabble Cheez-Its (Easy! 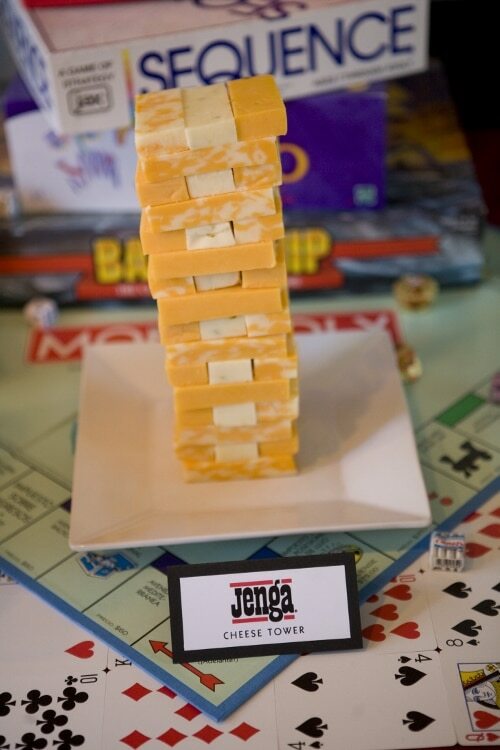 ), “Jenga” Cheese Tower (not so easy, it takes longer than you think), “Trivial Pursuit” fruit tray, “Apples to Apples” squeezers, Monopoly money chocolate bars, and “Domino” brownies. 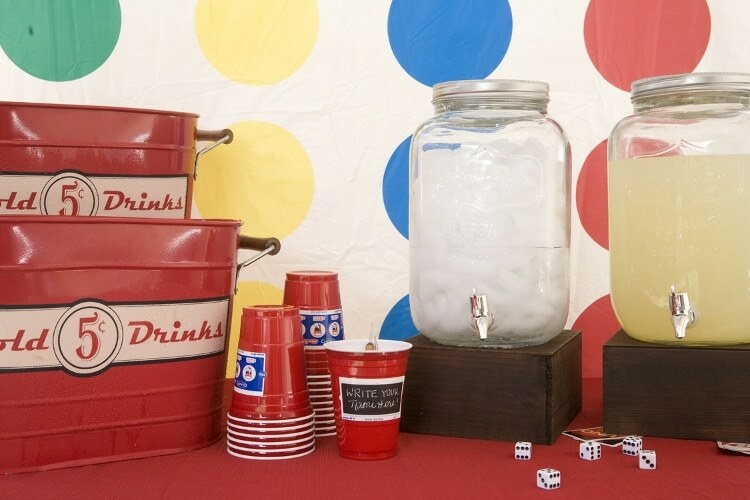 Here are some more party ideas to inspired you! Hello Dinar, this idea is so great. While I love it so much. 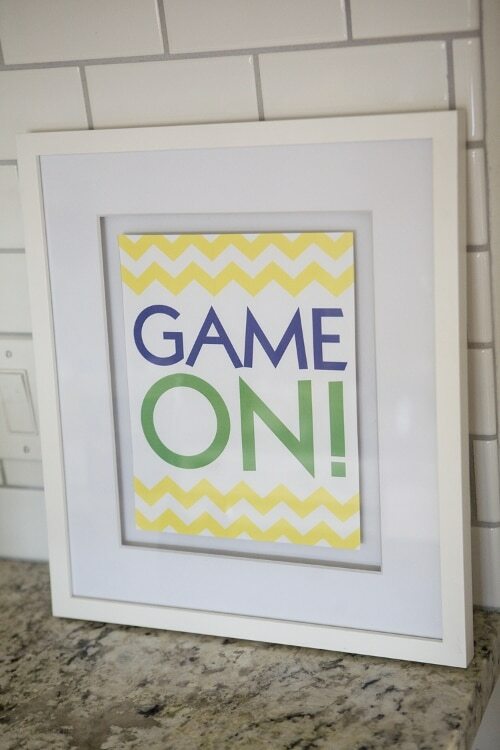 I would love to ask if you could share some game night hang out with the ladies. I’m looking to have a night out my girls but basically with games and wines. I want it to be worth the while,hemce I need your idea to perfectly carry it out. Hi Ekta! I did this party https://www.diyinspired.com/wine-tasting-party/ for a bridal shower, but you can turn it into a girls night wine tasting party. Hope this helps! 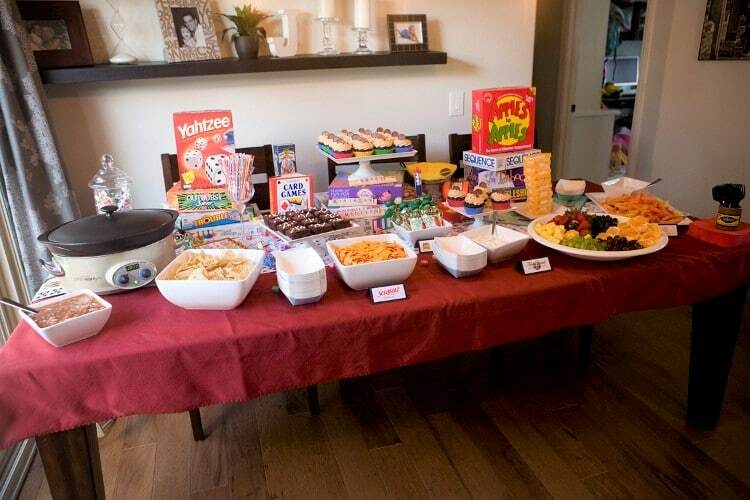 Most of the time while organizing birthday party and all, it’s true that we got confuse about the what type of decor we should prefer and what should be their in the menu. I and my wife most of the time prefer light food items for children that are easy digestible for the children and does not cause any harm to their health. 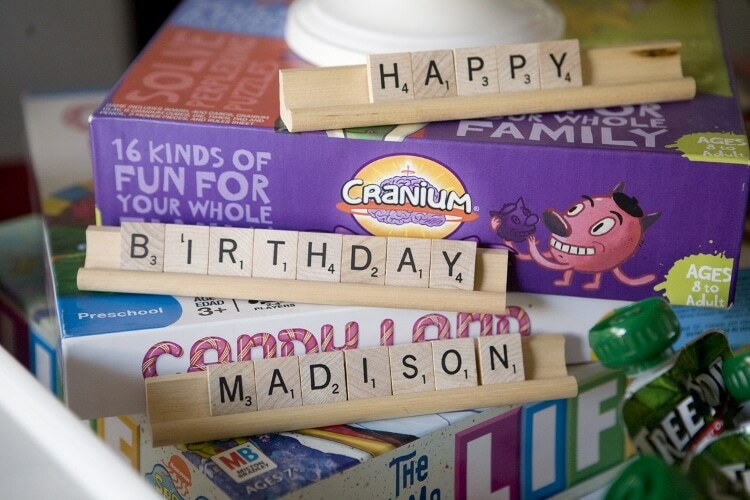 I really liked the idea of scrabble ideas. Thanks for giving me great ideas and good reading. I think this is the best ideas to make my children happy…thank you.